JOHANNESBURG — Gearhouse South Africa supplied lighting, video, staging and power for the 2009 Coca Cola Zero festival at Riversands Farm and the Lourensford Wine Estate in Cape Town. The events gave the Media and Lighting divisions a chance to use the Green Hippo Hippotizer HD digital media server for the first time. It was specified by Gearhouse director Tim Dunn. 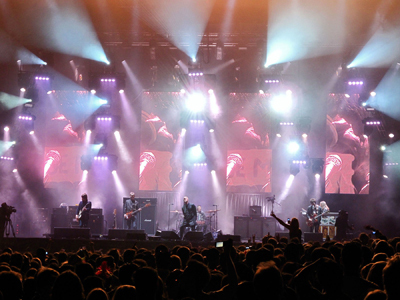 Oasis and Snow Patrol headlined the event, which also featured Panic at the Disco and six Africa-based bands — The Dirty Skirts, Zebra & Giraffe, Casette, Foto na dans, aKing and One Day Remains. A series of onstage LED screens displayed the content run through the Hippotizer and served as a backdrop for the daylight section of the performance. This included the five opening acts at each venue and part of Panic at The Disco’s set. The center stage screen, supplied by Gearhouse’s LEDVision, was made from a six-by-six array of panels of Lighthouse R16 LED and flanked by two columns made from two-by-six panel arrays. These visuals were augmented by two six-by-six panel side screens for the IMAG mix captured by seven cameras provided by EventCam. Gearhouse Media’s Chris Grandin ran the Hippotizer via a grandMA full size lighting console for the first six bands, concluding with Panic at the Disco. Snow Patrol and Oasis both of had their own self-contained shows. Grandin also operated a Barco Encore multi-screen control system, allowing any source, including the Hippo, other media servers and the camera feeds, to be output to any destination. “I set the Hippotizer up to run in busking mode,” Grandin said. “I had no set lists and there were no rehearsals, so it was a highly improvized show.” Each layer on the Hippo has two effect engines, which allowed him to use a variety of effects, including color sparkles and neon bumps, and to alter the hue, saturation and brightness, and so on, which let him flip into black and white or negative. Grandin also used a combination of Hippo library footage and specially created clips, and he liked being able to apply fades to kaleidoscopic effects and to build cues on the fly. “You can set up and programme a cue in no time, then just hit the ‘go’ button on the grandMA and achieve some very precise and intricate things with it,” he said. Grandin also ran live camera feeds through the Hippo at certain points. Even after seven hours of continuous live operation with 20 minute changeovers, he didn’t run out of ideas or options, “It’s an extremely dynamic piece of kit,” he said. Gearhouse’s StageCo roof system was used for both shows, and the lighting and sound rigs were also trucked from Johannesburg to Cape Town for the show there two days later. Lighting crew chief Jason Fritz worked with a team of six on a production lighting design by Pete Currier, based on Oasis’ rig, which was specified by their LD, Rob Gawler. The rig contained 85 Martin Professional MAC 2K moving lights — a combination of Spot and Wash fixtures and 26 High End Cyberlights with 32 Atomic strobes and four MDG smoke machines. The rig also included 28 i-Pix BB4 LED blinders, 24 i-Pix Satellite LED “bricks” used for truss toning, and a mix of generic PARs and ACLs. Gearhouse supplied another grandMA full size console to run lights for the local bands and Panic at The Disco. Oasis and Snow Patrol bought their own control systems, each featuring three Hog 3s. Snow Patrol’s show was run by their LD, Davy Sherwin, and live visuals director, Robin Haddow. This is the 4th year that GHSA has supplied the Coca Cola Festival for promoters Big Concerts.